Ginataang kalabasa or squash with coconut milk is one of the simplest Filipino vegetable recipes. This recipe has more pork in it, half of the amount of squash so it is more meaty. And when selecting or buying squash, look for young squash with the greenish colored peel and not brown because it is already tough and flesh is very firm. The young squash flesh should be yellow and a bit greenish on the edges of the peel when you slice it in half. If the flesh is dark orange, it is already mature and has lots of tough fibers. And with regard to the coconut milk, as much as possible buy them fresh which are often available in the wet market. It usually sold in small plastic bags or you can make your own by extracting the grated mature coconuts. It is a little tedious but the taste is worth the effort. Ginataang kalabasa or squash with coconut milk is one of the simplest Filipino vegetable recipes. Wash, peel and remove the seeds of the squash. Slice into 1 inch size then set aside. In an empty wok, heat oil and saute garlic, onion and tomato. When the onion and tomato is already cooked, add the pork belly and stir fry for a few minutes until the pork is light brown. Then add the shrimp paste and stir fry for a few minutes then add the squash. Stir fry again until the squash turns to bright yellow or orange depending on the kind of squash you bought. Then pour the coconut milk, add magic sarap seasoning and simmer until the squash is cooked. thank you for sharing all your recipes, a big big help for me. Thank you so much bro! 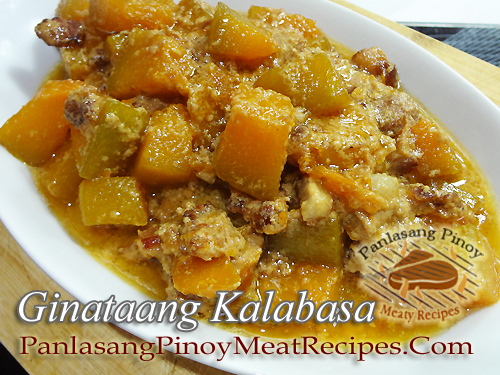 Thanks for your ginataang kalabasa recipe and also for the tips of selecting squash. I thought they are all the same. a massive thank u bro. Hi pwde po bang wlang ihalong bagoong s pagluluto nito…? Hi Raymond, yes pwede rin naman wag lagyan ng bagoong.